The 2012 Chevrolet Camaro ZL1, debuting today at the Chicago Auto Show, is the most powerful and technologically advanced Camaro ever built. It's not a muscle car anymore. No, now it's a mullet-wearing muscle missile straight from Tron's grid. The ZL1 name is derived from the all-aluminum racing engine of the same name, which was developed in the late 1960s and installed into a handful of regular-production 1969 Camaros. And by handful, we mean there were only 69 built with the engine, each representing the pinnacle in Camaro performance. Well, until now anyway. That's because the new ZL1, hitting the streets beginning in early 2012, is powered by the same burnout-inducing 550 HP, 550 lb-ft of torque 6.2-liter LSA V8 engine under the hood of the amazing Cadillac CTS-V. The LSA features an intercooled sixth-generation Eaton four-lobe rotor supercharger system, premium heat-resistant aluminum-alloy cylinder heads and high-strength hypereutectic pistons. Also, piston oil squirters. Squirters! But it's not just more power. The ZL1 also comes with a high-performance Tremec TR-6060 six-speed manual — the "MG9" version of the transmission, with a higher torque capacity. It's used with a dual-mass flywheel and twin-disc clutch for supposedly easy operation and shift smoothness. It'll also be connected to a stronger driveshaft and rear axle system. There's also a new, shorter-throw shifter to help buff book writers with gear changes. And a redesigned steering wheel, because apparently, they can sometimes be uncoordinated too. And the brakes! They're big, and by Brembo! We're talking about 14.6-inch (370 mm) two-piece front rotors with six-piston calipers; and the 14.4-inch (365 mm) rear rotors have four-piston calipers. The ZL1 is also equipped with a dual-mode exhaust system, which alters the sound level and character in response to engine rpm. First used on the Corvette, and specifically tuned for Camaro ZL1, the dual-mode exhaust will give the car a signature sound. We have no idea what that signature sound will sound like, but it'll be something. The new muscle missile gets a Magnetic Ride system that includes driver selectable modes (Tour and Sport) tailored for the preferred style of driving. It uses magneto-rheological science to produce shock damping with the highest level of precision, enabling body control optimized for excellent performance in everyday driving as well as track situations. And the looks! Well, the looks are sorta...umm... interesting. 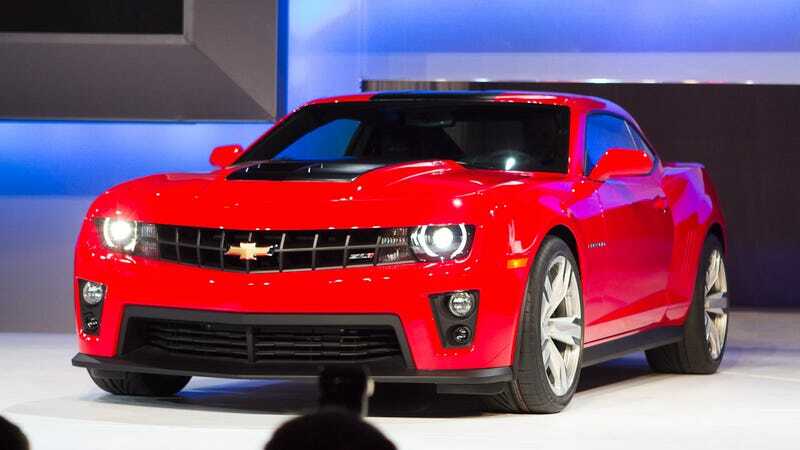 The ZL1 gets a redesigned front fascia and aluminum hood with a raised, carbon fiber insert. The fascia includes a front splitter and new vertical fog lamps with air intakes designed for brake cooling. The hood features front-mounted air extractors in a center body-contrast color section, in satin black carbon fiber, to help communicate the car is, you know, high-performance. Functionally, the air extractor is a key in connecting airflow closely to the bodywork, creating aerodynamic downforce. High-intensity discharge (HID) headlamps and fog lamps are standard. The rear of the car includes a diffuser and spoiler, also functional elements that enhance the car's aerodynamics. OK, so what do we think? Well, we LOVE the idea of the LSA engine and brake and suspension upgrades for the Camaro. The only problem is the name — it's too insidery. Even though it'll piss Camaro fan-boys off, Z28 would have been the smarter move from a "entice the general public to buy big engines" position. Secondarily, this isn't a limited-run special edition numbered with Bill & Ted's favorite innuendo-laced number — it'll be mass-produced. And frankly, that's not what a ZL1 should be. But you know what? So what. This car's gonna be the new muscle car hotness — and we want it. A lot.